Staff selection commission invited application for Combined Higher Secondary Level (10+2) Examination for varies posts of Lower Divisional Clerk/ Junior Secretariat Assistant, Postal Assistant/ Sorting Assistant and Data Entry Operators for various Ministries/ Departments/ Offices of the Government of India. 1) Lower Division Clerk (LDC)/ Junior Secretariat Assistant (JSA) - Pay Band -1 (Rs. 5200-20200), Grade Pay: Rs. 1900 (pre-revised). 3) Skill Test/ Typing Test (Tier-III). Junior Engineer (JE) (CIVIL Engineering / Electrical Mechanical Engineering), Assistant Grade ii (AG Ii) (HINDI), Steno Grade-Ii, Typist (HINDI) And Assistant Grade-Iii (AG Iii) (GENERAL / Accounts / Technical / Depot). J.E. (Civil Engineering) - age - 28Degree in Civil Engineering or Diploma in Civil Engineering with one year experience. AG-II (Hindi)- age - 28 - Degree of a recognized University with Hindi as the main subject / Proficiency in English. Age - 18 to 30 Years as on 01.07.2019. 3) AAO (Chartered Accountant) - Bachelor’s Degree , passed Final Examination of Institute of Chartered Accountants , Associate member of Institute of Chartered Accountants of India. Staff selection commission invited application from 12th slandered qualified candidates for 3259 posts in various category. The minimum qualification is plus two or equivalent. to apply' link provided at http://www.ssc.nic.in-> Apply-> CHSL. 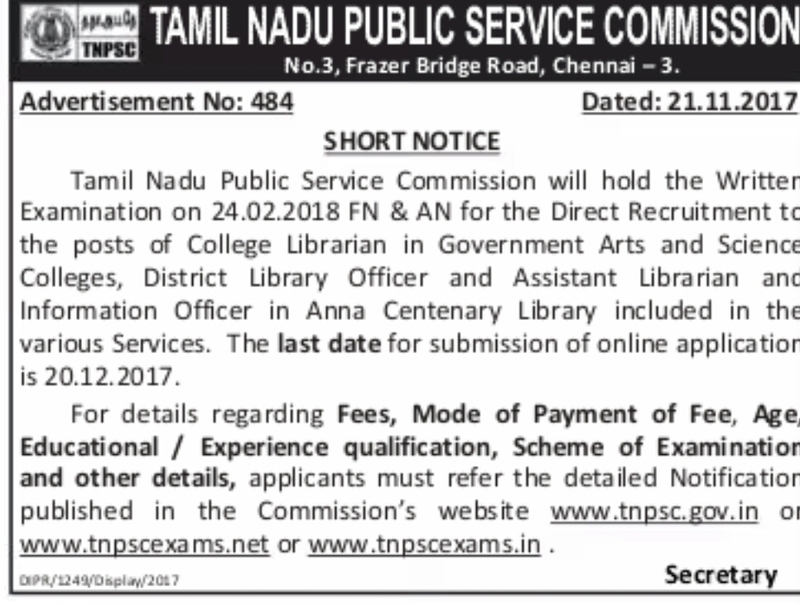 Tamil Nadu public service commission (TNPSC) invited application for Librarian in various posts. 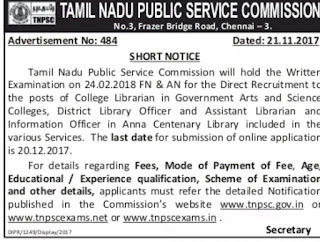 The vacancy includes College Librarian in Government Arts and Science College, District Library Officer, Assistant Librarian and Information officer in Anna Centenary Library. i) A Master’s degree in Arts and Science. (iii) Experience for a period of not less than three years in any of the Libraries in a Supervisory cadre.